For decades, designers have been trying to overcome the speed limitations of the helicopter while preserving its vertical take-off/landing capabilities. While there is some promise with the coaxial counter-rotating rotors of the Kamov family of helicopters as well as the Sikorsky X2 compound helicopter, Bell Helicopter has been developing the tiltrotor concept since the 1950s starting with aircraft like the XV-3, and advancing the technology with the X-22 in the 1960s, and the XV-15 in the 1970s. The V-22 Osprey was the first practical application of the tiltrotor technology, starting development in the 1980s and entering production in 1988. The Osprey had a number of developmental problems which were identified and rectified through engineering and/or training, including a crash at Pinal County Airport in 2000 (where I used to drop skydivers) that was attributed to operating the aircraft in certain cross-wind conditions. Unlike many other weapons systems acquisitions in recent years, the military services stayed with the aircraft where it entered operational service in 2007 as the MV-22B with the US Marine Corps and in 2009 as the CV-22B with the US Air Force. In the 1990s, Italeri released the first kit of the V-22 Osprey in any scale, this being in 1/48th. The kit was based on the early developmental airframes which lacked the various sensor bumps, FLIR turret, air refueling boom, and antenna suite. 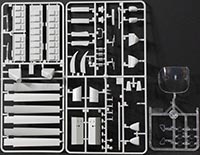 The kit was also engineered at a time when Italeri still used a mix of scribed and raised surface detailing, so there was no issue with the assembled model slipping out of my hand. In 2012 (if not a little before), Italeri introduced part tree F, which added many of the missing details including the details mentioned above. 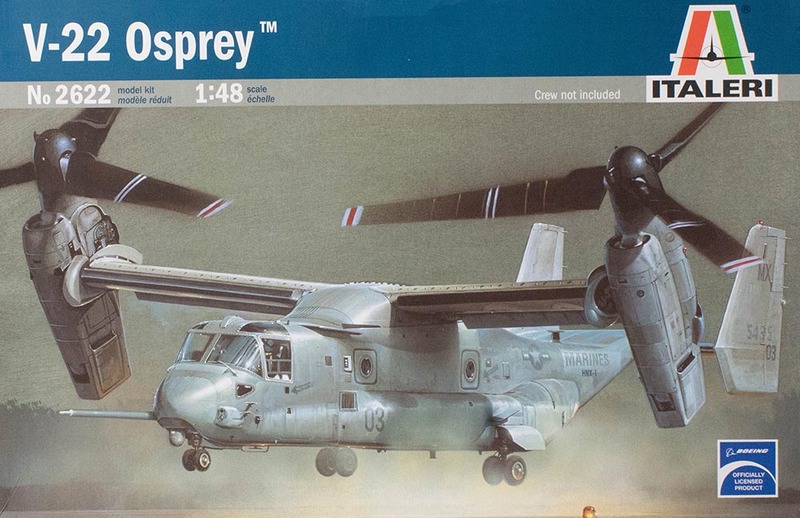 A year later, Hasegawa introduced the MV-22B and CV-22B kits in 1/72 scale and these are the best Osprey kits currently available in any scale. While Italeri did attempt to update the kit, it still needs some love. 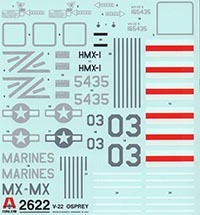 Markings are provided for a USMC developmental MV-22B 166435 from HMX-1, circa 2001. The first task will be to remove all of the raised details and verify the accuracy of the scribed details. Key raised details will need to be scribed. There are enough good photos online to help with this process. The flight deck needs some work. Again, there are some good online photos showing the lack of detail including missing collective and odd rudder pedals. The cyclics seem out of scale and will need to be revised/replaced. The instrument panel looks good and using reference photos, the center and overhead consoles will need help. This would be so much easier with a nice resin cockpit set! The main cabin has a good deck and side walls with stowed seating. What is missing is the upper sections of the walls and overhead panels as well as the various ducts that run through there. Speaking of main cabin, the crew entry door is molded closed, but some careful surgery and a bit of scratch-building will open this area up. Air refueling boom - check your references but the boom isn't always installed. We're on our own for decals at present. There are some interesting schemes including some colorful commanders' aircraft that will hopefully be captured as decals. There is also at least one MV-22B that received what appears to be HAVE GLASS which would make for a nice subject as well. The last time I saw this kit, Parts F had not yet been developed and I was reluctant to acquire one for several years, but I finally broke down to see what it would take to transform this kit into a current-service aircraft. While there is some work required to get this kit up to 'standard', I am quite surprised that Italeri is still the only company to produce the Osprey in 1/48 scale and that the aftermarket decal and detail companies have largely ignored the subject. For the time being, we'll have to use our modeling skills to get this bird into shape.